These days, potholes and pavement deterioration make it a challenge to keep the wheel steady on America's roads and highways. More than a quarter of the nation's major urban roadways -- highways and major streets that are the main routes for commuters and commerce -- are in poor condition. These critical links in the nation's transportation system carry 78 percent of the approximately 2 trillion miles driven annually in urban America. With state and local governments unable to adequately fund road repairs and with the current federal surface transportation program set to expire on September 30, 2014, road conditions could get even worse in the future. 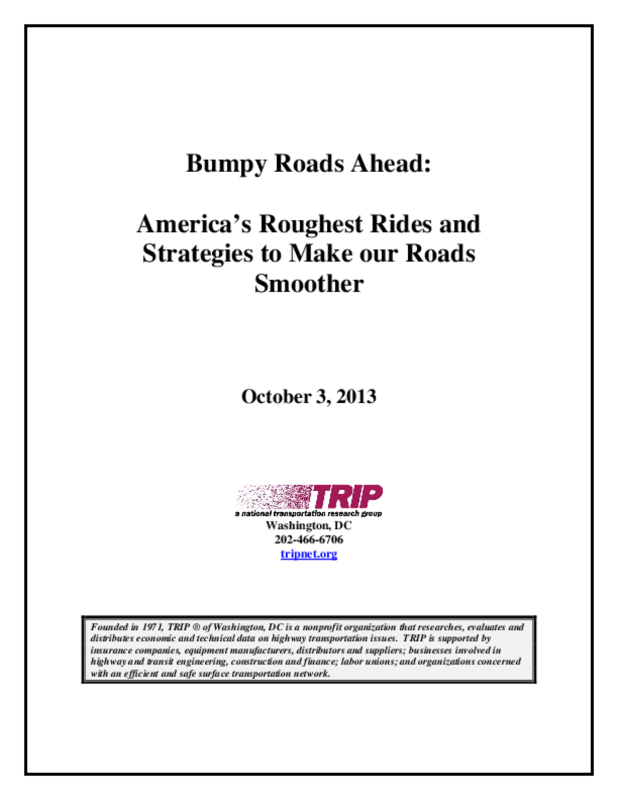 In this report, TRIP examines the condition of the nation's major urban roads, including pavement condition data for America's most populous urban areas, recent trends in travel, the latest developments in repairing roads and building them to last longer, and the funding levels needed to adequately address America's deteriorated roadways. For the purposes of this report, an urban area includes the major city in a region and its neighboring or surrounding suburban areas. Pavement condition data are the latest available and are derived from the Federal Highway Administration's (FHWA) 2011 annual survey of state transportation officials on the condition of major state and locally maintained roads and highways, based on a uniform pavement rating index. The pavement rating index measures the level of smoothness of pavement surfaces, supplying information on the ride quality provided by road and highway surfaces.